Differences between Giani Iqbal Singh, Jathedar of Patna Sahib, and SGPC president Avtar Singh have been resolved following their meeting in the presence of Baba Harnam Singh Khalsa, chief of the Damdami Taksal, and Giani Partap Singh, Head Granthi, Hazur Sahib. Chief Minister Parkash Singh Badal's dream project of providing free technical education to the poor and not-so-poor brilliant students with a family income of Rs 2.5 lakh per annum, seems to be stuck in the official rigmarole. Punjab farmers who are not covered under the Central loan waiver scheme have decided to wait and watch rather than settle their loans under the one-time settlement scheme which offers them rebate of 25 per cent. Paksitan Peoples’ Party (PPP) chief Asif Ali Zardari and Pakistan foreign minister Qureshi, minister for information Sherry Rehman and Chief Minister of Punjab Shahbaz Sharif will participate on the Indian side for candlelight vigil to celebrate Independence Day functions of India and Pakistan on the midnight of August 14/15 at the Attari-Wagah joint check-post here. Bharat Petroleum Corporation Limited (BPCL) is looking at making Punjab a major hub for producing non-conventional energy, equating Punjab with Uttar Pradesh, where BPCL has launched a pilot project to produce biodiesel from Jatropha. 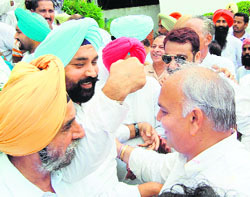 PPCC working president Mohinder Singh Kaypee, who was given a rousing reception here today, met expelled party leaders, including Harjinder Singh Thekedar, former MLA. His action has indications of bringing all party rebels on a single platform to defeat the ruling SAD-BJP alliance in the coming Lok Sabha elections. The Shiromani Akali Dal (Amritsar) will contest Lok Sabha elections on Sikh agenda as various political parties have failed to protect interests of the community. The Punjab government has set up another committee to look into the problem of pollution in the Sutlej and the Sirhind canal. Chief Minister Parkash Singh Badal today assured the Bharti Kisan Union (BKU) that foodgrains would not be taxed to generate funds for Punjab Agricultural University (PAU). The BBMB Employees Association held a gate rally outside the office of the BBMB in connection with their long-pending demands. A panchayat member of Chak Dana village under Sadar police station committed suicide after killing his wife and two daughters at his house today evening. The Punjab and Haryana High Court wants to convert into a public interest litigation a petition against continuation of tainted police officers on key positions. Taking up the issue, a Division Bench of the High Court, headed by Justice Mehtab Singh Gill, ruled the petition pertained to the implementation of Section 13 and 15 of the Punjab Police Act, which mandated the removal of charge-sheeted officers. 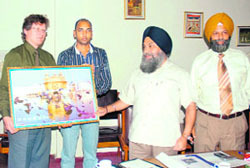 The California-based San Jose State University is exploring possibilities of forming a tie-up with the Punjabi University, Patiala, in the fields of electrical and computer engineering, besides holding of bilateral and regular student and faculty exchange programmes. Students preparing for IIT examination and teachers of the Narayana Institute of Competitive Examination went on strike here this evening when four teachers were allegedly sacked. At least 40 students raised slogans saying their studies were hampered due to frequent change of teachers. The government has asked post-matric students from the SC strata to avail themselves of a scholarship scheme. The panchayat administrator of 23 villages in Kiratpur Sahib, junior engineer Naresh Kumar, has been accused of selling off village Dehni’s panchayat land to 495 persons for commercial ventures illegally. ASI Gurvail Singh, who was run over by a vehicle of agitators protesting the release of “Singh Is Kinng” on Friday evening, died in the hospital here today.